National Poison Prevention Week. It's March 14-20, 2010. 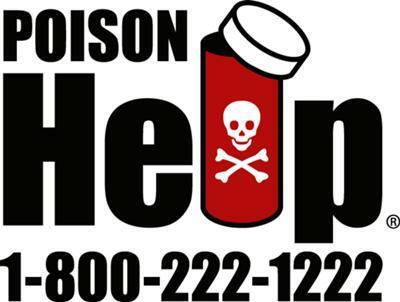 Did you know that there is a National Poison Prevention Week? I didn't! This is something I just found out about and I think it's WONDERFUL!! There are two themes this year for National Poison Prevention Week. Theme #1: Children Act fast.... So do Poisons! This would be a great time to talk with your children about poisons! -ALWAYS call medicine by it's name, NEVER call it Candy! -Keep poisonous plants out of reach of children & Pets--better yet, don't even bring them into your home! For a list of poisonous plants call 1-800-222-1222. "A child is accidentally poisoned every 30 seconds at home..."
Let's All work together to prevent Poisonings! When you dial this number, your call will be routed to the local poison center in your area. Your local poison control center will be happy to assist you in any way! Thank you very much for this information. I didn't know about National Poison Prevention Week either. I will be working with my children more this month to learn about poisons. Thank you for the advice about Medicine and not calling it candy. My friend does that with her children and doesn't believe it's bad. I will direct her here to look at this. Again thank you. Candy & Medicine Look Alike! BE AWARE! Candy and Medicine look very much a like and poses a HUGE danger for our children! REMEMBER Your child is Unable to read the label & Medicine Looks like Candy to Them! - Medicine should be stored where children can not SEE or REACH them! - Know that NOTHING is completely Childproof-- But Make sure there is childproof Packaging if possible! - Make sure you ALWAYS take medicine out of sight from children. Kids learn everything by watching and imitating! - It is important to teach your child to always ask an adult before putting anything into their mouths! I really hope these tips help! Keep reminding friends and family to call Medicine by it's name and not Candy! Remind Grandparents & other caregivers of the same thing when your child is visiting!! Join in and write your own page! It's easy to do. How? Simply click here to return to Green Tips.